Do you need your natural gas line repaired? Are you in need of pipe work or doing a home renovation project? Trust our expert plumbers with your repair. Amana brand's parent company has invested over $440M in a new state-of-the-art facility located just outside of Houston Texas. 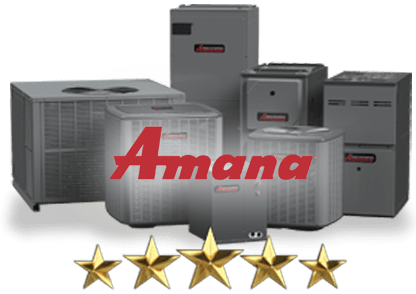 In fact, we value American Pride so much that ALL AMANA brand heating and cooling systems are designed, engineered, and manufactured in the U.S.A.
No matter which service you choose, our staff ensures everything is neat, tidy, and properly working according to the manufacturer's specifications. Our company offers installation, repair, and service of residential and commercial heating and air systems at a low, diagnostic rate. Our company also installs new custom duct work in your home. As well, our company offers sales of new heating and air-conditioning equipment, with the installation costs included in the price. Don't miss out on converting from oil to gas. We do all the work for you. All you have to do is enjoy to savings from converting. We are also proud to offer plumbing and gas piping services. If you are in need of a toilet repair or if you have a leaky faucet or if you need gas fitting services, give us a call. Our family-owned business started with basic services in 1983, and has grown to include services that use the latest technology. Providing customers with aesthetically-pleasing and properly functioning equipment is what makes us happy. 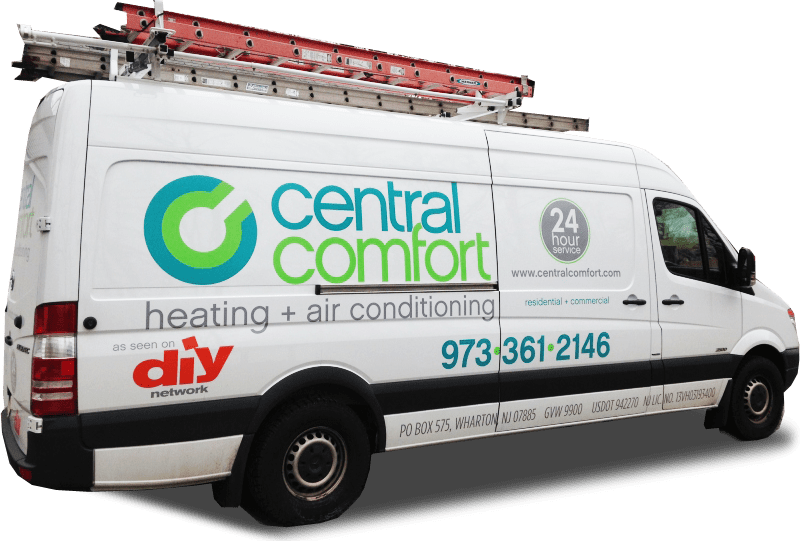 Central Comfort, Inc., is a New Jersey (NJ) Heating, Cooling, Plumbing, Air Conditioning, ductless mini split, Geothermal Heat Pump, and furnace repair, service, replacement and maintenance Company located in Morris County. Central Comfort, Inc. employs only the best plumbers & technicians for plumbing repairs, air conditioner repairs and, gas or propane (lp) furnace repairs as well as all air conditioner replacements, furnace replacements, tankless hot water heater installations, and boiler replacements in Sparta NJ, Morristown NJ, Roxbury NJ, Randolph NJ, Dover NJ, Denville NJ, Hopatcong NJ, Mt Olive Twp NJ, Montville NJ, Stanhope NJ, Parsippan-Troy NJ, Rockaway NJ, Jefferson NJ, Chester Twp NJ, Byram Twp NJ, Whippany NJ, Boonton NJ, Butler NJ, Chatham NJ, Chester NJ, East Hanover NJ, Florham Park NJ, Hanover NJ, Harding NJ, Kinnelon NJ, Long Valley NJ, Madison NJ, Mendham NJ, Mine Hill NJ, Morris Plains NJ, Mount Arlington NJ, Mountain Lakes NJ, Parsippany NJ, Pequannock NJ, Riverdale NJ, Wharton NJ, Bloomingdale NJ, Haledon NJ, North Haledon NJ, Patterson NJ, Totowa NJ, Wanaque NJ, Ampere NJ, Brookdale NJ, Essex Fells NJ, Livingston NJ, Millburn NJ, Montclair NJ, North Caldwell NJ, Roseland NJ, Upper Montclair NJ, Verona NJ, West Caldwell NJ, Andover NJ, Branchville NJ, Budd Lake NJ, Byram NJ, Franford NJ, Fredon NJ, Hamburg NJ, Hampton NJ, Hardyston NJ, Lafayette NJ, Nectong NJ, Newton NJ, Oak Ridge NJ, Ogdensburg NJ, Sandyston NJ, Stillwater NJ, Sussex NJ, Vernon NJ. So when you ask to find "A good Heating, Cooling, Plumbing, Air Conditioning, ductless mini split, Geothermal Heat Pump, and furnace repair or service company near me," you've come to the right place. To set-up a repair service estimate or replacement estimate, call 973-361-2146. Central Comfort services all furnace, AC, humidifier, filter, thermostat and water heater brands including Carrier, Bryant, Payne, Trane, Lennox, Rheem, Ruud, Amana, Crown, Frigidaire, Daikin, Mitsubishi, Fujitsu, Gibson, Goodman, Lochinvar, Maytag, Weil McLain, A O Smith, Kohler, American Standard, GeoExcel, General, Aprilaire, Honeywell, White Rodgers, Dynamic and Skuttle.